Please call for prices. Travel , Sundays and Public holidays available upon request. Treat yourself, be spoiled and feel empowered with the beauty therapists at Eclipse Day Spa. Our team of professional makeup artists are here to make you feel proud, comfortable and inspired by your beauty. We advocate happy lifestyles and healthy living practices, and do this through our extensive list of treatments. Along with our body and massage treatments, we have a team of highly skilled and experienced makeup artists on hand to help you look and feel anew. Be spoiled, pampered and indulge yourself with the beauty therapists at Eclipse Day Spa. We take your health, happiness and self-confidence seriously here at Eclipse Day Spa. Located near Rosebud on the Mornington Peninsula, allow yourself some serious me time with the makeup specialists at Eclipse Day Spa. The team of highly trained and experienced makeup artists at Eclipse Day Spa have the required skills to provide a full special events makeup service. Regardless of the occasion: a Mornington Peninsula wedding, school formal, black tie gala, whatever it is Eclipse Day Spa has you covered with the full treatment. Our makeup artists have a dedication for inspiring elegance and sophistication, and our treatment does just that. Simply join us at our Rye day spa and discuss with our artists the styling you are going for. Then all you have to is relax, sit back and allow our beauty therapists to transform your look into a style that exudes elegance. 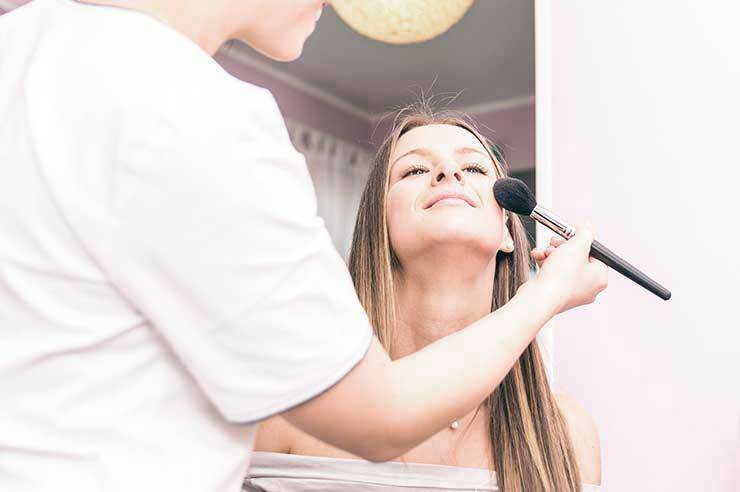 Our beauty therapists have been offering high-class makeup services throughout their careers, and have the skills to make you look and feel empowered. If you have a special event coming up that you want to absolutely amazing for, why not complete the treatment with Eclipse Day Spa’s comprehensive list of beauty services? Our treatments cover all the stops for looking outstanding and impressing friends and family. Our service includes tanning, waxing, facial treatments and lash extensions, each provided by one of our highly experienced beauty therapists. If you would like to find out more about a treatment with one of our makeup artists, or would like to book a session at our Rye spa, please feel free to get in contact with the team at Eclipse Day Spa. Call us on 03 5985 1155 or send us a message via our contact page. We will get back to you as soon as possible and with all the information you require regarding your makeup treatment.